Starring Joaquin Phoenix as Theodore Twombly, "Her" is set in a nearby future. It is an urban, technology-rich environment with which we can readily identify - not some wacky far-off science fiction world. Twombly makes a living by writing personal love letters for people with difficulties expressing their feelings- though ironically his own marriage has crumbled. The film was written and directed by Spike Jonze. I think we all know what a computer operating system is. Well in Twombly's world, a new kind of intelligent operating system has been devised which is so advanced that the voice of the system attunes itself to its owner. Twombly wear an earpiece and he can for example instruct the voice to read his emails or play him particular pieces of music. He gives this increasingly seductive digital companion a name - Samanatha - who, incidentally, is voiced by the actress Scarlett Johansson. As you may have already guessed, Twombly begins to fall in love with Samantha. She seems so much a genuine presence that he even takes her on a double date to Catalina Island with an office colleague and his girlfriend. They also wear the requisite earpieces. Making his way between home and work, it begins to dawn on Twombly that many of his fellow city dwellers are also in intimate relationships with their operating systems and he asks Samantha how many other users she is in love with. She says 641. At the end of the film, Twombly sits on the roof of his apartment block with the girl from next door - Amy (Amy Adams) who has also had relationship problems with a real man and with her own operating system voice. They look out over a beautiful, electric twinkling cityscape and she rests her head on his shoulder - as if the promise of genuine human love remains beyond the bounds of the film. Science fiction and fantasy don't readily appeal to me. I normally prefer films that are very much rooted in real human experience - such as "Twelve Years A Slave" or "Long Road to Freedom" but "Her" was genuinely engaging and Joaquin Phoenix played his role with appropriate amounts of understatement and vulnerability. You look around yourself today and you see people who are quite obsessed with their mobile devices - headphones in, smiling inanely, sometimes holding conversations through hidden microphones - like lunatics walking around talking to nobody. It is already becoming a world in which everyday reality is retreating as people embrace the comfort of their virtual sanctuaries. And it seems to me that Spike Jonze has simply stretched that slightly frightening notion a little further - holding up a mirror to give us a partial image of what we might become. Today I undertook a ten mile country hike between Chesterfield and Mansfield - in the vicinity of Hardwicke Hall. It's an area I had never before explored on foot. Before setting off, I printed a map from the Ordnance Survey "Get a Map" site and planned to park in a little place called Ault Hucknall. And here's the church in Ault Hucknall. Like many parish churches it was named after St John The Baptist. And here are snowdrops growing by old graves in the churchyard. When I got home I did a little internet research courtesy of our omnipotent and omniscient creator - Lord Google Almighty - and I discovered that Ault Hucknall is in fact the smallest village in England! Those who stand by that claim point out that hamlets do not have churches but villages do. That tiny settlement is at the heart of the parish of Ault Hucknall and the old church would have served surrounding farms and several other small settlements as grave inscriptions handily demonstrate. Finally, here's a water spout I spotted high on the church tower. How many showers - how many rainstorms has that weathered fellow spewed to the ground? Perhaps it's an owl. And how many weddings, and funeral processions, christenings and vicars? And perhaps he wonders - how much longer can this church carry on functioning in a world where the traditional Christian God appears to be skulking away into history? It was the summer of 1845 and Charlotte Bronte was twenty nine years old. She had worked as a governess in several well-to-do Yorkshire homes and the previous year had visited Brussels in Belgium where she was attached to a finishing school both as student and teacher. Following a family bereavement, she and her sister Emily had been obliged to return to the family home at Haworth - a village which lies some fifty miles north of Sheffield on the edge of the Pennine hills. "Oh papa, I don't know what to do with myself. I feel so distracted now I am back in Haworth. May I go to visit my darling friend Ellen who is spending the summer with her brother the Reverend Bussey in the village of Hathersage in northern Derbyshire. She has invited me and I haven't seen her in three long years. May I go papa? May I?" "Your brother Branwell is ill and needs your attention my dear but I suppose that Emily and Anne can manage the house for a month. I will have Brague take you into Keighley in the trap on Friday morning and from thence I believe you may now travel by train to Sheffield. You will have to inquire at Sheffield station about travelling onwards to Hathersage. Or perhaps you could walk..."
And so Charlotte came to stay at Hathersage Vicarage. If you enlarge the picture below with a click you should be able to make out the spire of the parish church. The vicarage is right next door to that church and incidentally, in the adjacent graveyard Robin Hood's companion - Little John is buried. "Oh Ellen, I don't know what to do with myself. I feel so distracted. It is a bright and sunny day. Might we go walking to aid our digestion and our spirits?" "Oh yes my darling Charlotte but we must wear our bonnets in case we catch a chill for the wind blows cold from the moors, even in summer time. We shall stroll along the byways to North Lees Hall where the Eyres reside. You met them at matins on Sunday. They are amiable people." "Oh this moorland is so rugged Ellen and the stone edge above suggests that the ribs of the earth are exposed to the elements. It reminds me so much of Top Withens near Haworth where Emily will often ramble. So wild and free. I shall describe this landscape in my book." "What are you going to call it?" "I am thinking of Jane but so far I haven't chosen a surname for her. Perhaps Bussey! (They titter) Oh, what is that down in the valley Ellen? See how the green pastures contrast with the vegetation of the moors. It looks so beautiful and yet so perilous too - as if the moors will creep down to reclaim the farmland." "Oh my darling Charlotte, you have such an imagination! That is North Lees Hall where the Eyres reside. Let us tarry no longer." And so they arrive at North Lees Hall where they are greeted by Mrs Eyre. Tea is served by a leering, elderly butler called Gowans and Mrs Eyre tells Charlotte something of the history of the sixteenth century house and of life at the top of the Hood Brook Valley looking westwards to Hathersage church and the Hope Valley. "I've got it Ellen, I know what I'll call my Jane... Eyre! Yes. Jane Eyre. That will do very nicely." Cardiff is the capital of Wales. We drove down there on Saturday morning. M1 to M42, M42 to M5, M5 to M4 - then across the Severn Bridge to that land of harps and daffodils, sheep and rugby, leeks and male voice choirs, Earl Gray and Dame Jenny. The journey took three hours and forty five minutes. We parked at the international athletics stadium and then wandered across the road to a giant ASDA superstore with its attached cafeteria. All the tables were occupied but a man on his own signalled that we could join him at his table. He was squeezed into one of those electric mobility scooters and at first sight he looked as if he was in training for the Fattest Man in Wales competition. But he was a nice fellow - quite intelligent and somehow he let it be known that he hadn't always been disabled. Diabetes had been his downfall and he admitted that he was in something of a Catch 22 situation with regard to his health. The pounds had piled on and his inability to exercise or burn off calories had turned him into a a huge, wobbly Welsh pudding. Michael David - for that was his name - was in that neck of the woods for the same reason as us. We had come to watch the Premiership football match between Cardiff City and my beloved Tigers - Hull City. Cardiff City's new stadium is on the other side of the ASDA car park. Our teams have something in common in that both have prosperous. power-crazed chairmen who have shown scant regard for our clubs' histories or heritage. There were two intriguing chants that both sets of fans joined in "You're Cardiff City - You'll Always Be Blue!" and "Stand Up for The History! Stand Up for The History!" I could explain the details of what lay behind these chants but we'd be here all day. After the game we drove to Barry as most hotel rooms in Cardiff had been taken up by rugby supporters from the Friday night Six Nations game between Wales and France - also played in the city. We stayed at the economical Mount Sorrel Hotel. After depositing our bags, we wandered down to the Borough Inn on the High Street for a couple of celebratory pre-dinner drinks. Then on to the Shahi Noor Tandoori. Lamb balti, potato rice, nan bread - all very nice. Then afterwards up to "The Park" for a couple more pints and then "Match of the Day" back at the hotel. And lo The Lord spake and his voice was mighty and wrathful and he saw that Judas of Yorkshire, born of Satan's line, had succumbed to the sin of sloth and The Lord was most displeased. And in his eternal wisdom, The Lord commanded Judas to go out into the fields and to walk amongst the hills and to observe the beasts of the fields, the soaring birds of the skies and the plants that grow in great fecundity from the earth below our feet. And here's an old sheep barn just west of Brown Edge Farm. It's not the first time I have captured it with a camera. Beyond it you can see Rud Hill. The undulations in the foreground relate to long defunct stone quarrying activity. It wasn't the longest of walks. Just an hour long stroll. On Bassett Lane, I noticed snowdrops growing on the verge. In England they tell us that springtime is almost here and soon there will be daffodils and blossom and new spring lambs. Not far from those promising snowdrops I looked across a sheep pasture towards Sheffield. There was just the ghost of a rainbow. Can you see it? And when Judas returned from his sojourn in the wilderness, The Lord said that he mayest drink from the leaves of the tea plant and eateth the remaining custard tart. And Judas did as The Lord commandeth and pledged that he would no longer partake of the forbidden gruel that is idleness...until tomorrow. "Procrastination is the spice of life!" was shouted from a window on the campus of the University of Stirling - probably some time during 1975 - or maybe 1976. It was a woman's voice and she remains anonymous and unknown to me. Funny how certain things stick with you. Once I was Mr Busy Bee. There weren't enough hours in the day. Up with the larks, I scooted to the shower, dressed in record time and leapt downstairs to gulp scalding tea and consume a slice of toast in one enormous mouthful. Then grab school bag and keys, out to the car. And it was always 7.52 exactly. Zooming to the school, I knew the quickest route like the back of my hand. The work was always full on. With my English team, we often felt like firefighters, beating down those crackling bush fires. We had working lunches - not the ones others might enjoy - but literal working lunches - at one's desk or computer - filling in data, checking work-related messages, marking books while munching on sandwiches. Towards the end, I gave up making tea or coffee at work because that took too much time so I just swigged water from a two litre bottle. As the head of department, the buck stopped with me. I had other people's discipline issues to address. Hundreds of times I had to leave my own classes to deal with recalcitrant, awkward, lazy, disruptive, violent or mentally disturbed children in corridors. Often they came back to my classroom and sat at the side or we'd try to get the superior and often dismissive senior management team to roll up their sleeves and support us - that is if we could locate them. And staff were sometimes at the end of their wits. There were tears, "sickies", anti-depressant tablets, problems at home, arguments, letting off steam. After the often stormy weather of each timetabled school day had passed, there were usually meetings to attend, things to sort out or on Thursdays - detentions to administer. I returned home between six and six thirty - unless there was a parents' evening to attend. Back home, I'd take my schoolbag from my car. It always contained a bunch of pressing things to do or pupils' assignments to mark and assess. I would frequently do an hour or two of school work late at night before retiring to bed and Sunday evenings were often devoted - not to my wife and children - but to that damnable black school bag - its mouth forever open and endlessly deep. That's how it was. In another life. 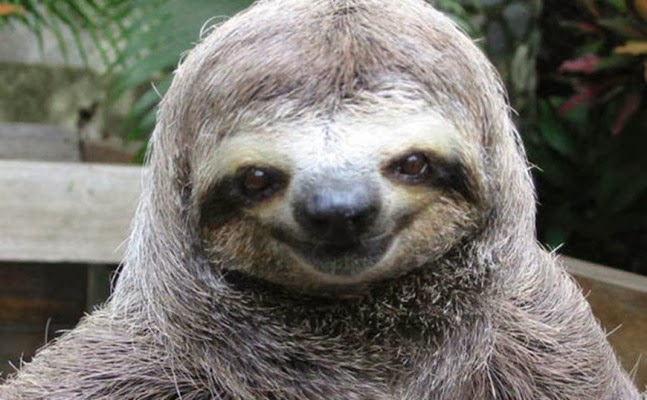 Now I am not Mr Busy Bee, I am instead Mr Idle Sloth. This blog might have accidentally given you the impression that I spend all of my time hiking around the countryside or taking photographs, watching films, travelling abroad, maintaining this house or reading books but if the truth be known Mr I.Sloth spends the majority of his time just lazing about. Forgive me Father for I have sinned. I confess. No need to get up early. Put the news on the radio at nine o'clock. Dressing gown and downstairs. Tea and porridge or egg on toast. Watch some "Home Under the Hammer" or "Down Under Revisited" - just now its the Winter Olympics - women's curling and I am not talking about their flowing locks. Another mug of tea. Still in dressing gown. Wander outside to feed the birds - though we see less than we used to do. Switch on this computer. Check out familiar sites. Check emails. Check blogs. Maybe write a blogpost like this one. The morning drifts away. Time for a leisurely shower while listening to "You and Yours" on Radio 4. Get dressed. Make the bed. Empty the dishwasher. Check the mail. Make some lunch. It was on a morning such as this that I recently missed a dental appointment. Too busy being slothful to look at the calendar and now that excellent NHS dental practice has banished me in spite of my protestations. I have to get on the list of another practice. If only we could have dealt with school pupils like that when I was Mr Busy Bee - "You failed to hand your assignment in on time so your exam entry has been cancelled" or "You played truant on Wednesday so you are off the school roll and you'll have to find another school to disrupt!". Of course, sloth is one of the seven deadly sins but I don't feel too guilty about it. Pottering around, wasting time, relaxing. It's like payback time for those endless busy bee days. My afternoons are dictated by the weather. Country walking - shopping - making the evening meal. Then there's "Pointless " on the TV with the affable Alexander Armstrong and Richard Osman. Like the woman shouted, and maybe it's true, "Procrastination is the spice of life!" There's a lot to be said for idleness. It was taken in 2009 when I visited Easter Island. It shows Pu o Hiro - The Trumpet Stone. This picture alone has received 18,858 views. 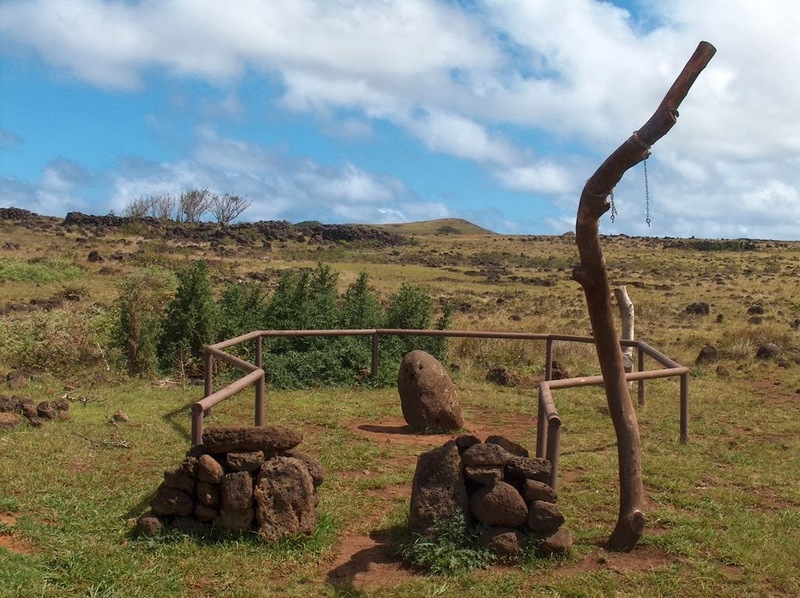 Everybody is aware of the stone statues or "moai" on Easter Island but there are many other archaeological remains there - including this stone which has holes near the top and allegedly was blown like a trumpet to summon islanders to meetings. To visit my Panoramio album, go here. I know that Mountain Thyme in Colorado likes to pin down where I have been walking using Google imaging. It was east of Bolsterstone to the north of the Ewden Valley, just below Stocksbridge. I had chosen to walk up on the hill in the vain hope that recent rain might have drained away. No chance. At times I felt like a World War One soldier at Passchendaele. My trusty boots were smothered in milk chocolate coloured mud. Fortunately, German soldiers were not shooting at me from their Teutonic trenches.. Above you can see lofty Hollin Edge Farm. Here I spoke with the ruddy faced farmer for a good few minutes. He was a pleasant fellow - born on this farm and he has lived there throughout his fifty hilltop years. He told me that his father had died two years ago and I sensed that his pain was still very raw. I guess that his father taught him everything he knows about hill farming - especially rearing sheep. They must have been very close - living and working together for so long. It may look ancient but the cairn above was erected in the 1870's. It is near the village of Bolsterstone and was constructed on top of Walder's Low which is a very ancient mound - the burial place of a Saxon chieftain - probably around 700AD. Above, a muddy white horse looks for something green to graze upon on Sunny Bank. Beyond, you can see brimful Broomhead Reservoir in the valley. If only we could export some of this water to southern California! Soon the non-sexual slipping and sliding and squelching was over. Walking down a tarmac track, back to my car, I tried to wash my boots in the clear water that was cascading from the hill above. It was as if the road had become a stream bed. It had only been a short two hour walk because I needed to get back home. Our friends and neighbours - Jackie and Martin - had invited Shirley and I round to their house for Sunday dinner. Wine, beer, laughter and good home made food. The feast lasted a full five hours - putting a bit of welcome sparkle into the middle of muddy February. 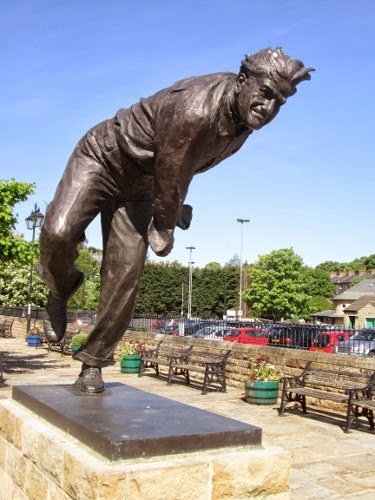 Frederick Sewards Trueman - the famous Yorkshire and England fast bowler. He was born into a poor family in the South Yorkshire hamlet of Stainton in 1931 - weighing 14lbs 1oz at birth. His father played for the village cricket team and later - when Fred was at Maltby Secondary School - he began to show his own talent as a fast bowler. By the age of sixteen he was playing for the Sheffield United cricket club and by the age of eighteen - in 1949 - he was plunged into Yorkshire first team. Nicknamed "Fiery Fred" because of his pace and his brusque Yorkshire demeanour, Freddie first played for England in June 1952 against India - taking seven wickets in the match. His first class figures are impressive. In county cricket he played in 603 matches taking 2304 wickets at an average of 18.5 runs per wicket. At test level, he played in 67 matches, taking 307 wickets at an average of 21.57 runs per wicket. On twenty eight occasions he managed a ten wicket haul in first class matches. 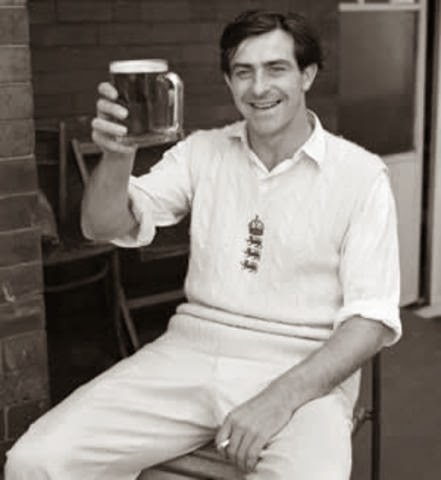 Not only was Fred Trueman one of the most magnificent fast bowlers England has ever produced, he was also one of the game's greatest characters. Trueman anecdotes, many of them embellished, others simply untrue, have enlivened many a cricket-dinner speech - and will continue to do so long after his passing. His natural ability was supported by a fearsome image and a caustic wit. One true anecdote concerns his outcry - he would not have termed it sledging - to the Warwickshire batsman Billy Ibadulla. "You've got more edges than a broken pisspot," he exclaimed. He suggested to John Arlott, half jokingly, that his biography should be called "T'definitive story of't 'finest fast bowler that ever drew breath." God hath been wreaking his dark vengeance upon the sodomites and sinners who live in the south of England - sending biblical floods upon them and lashing their seaside boltholes with almighty tempests and crashing salt waves. Iniquitous Wales has also aroused God's wrath and lo, he hath thrashed England's Gomorrah - the unholy seaside resort of Blackpool . Meanwhile, in sunny Yorkshire, your meek and most reverential correspondent Brother Pudding did walketh out in the countryside yesterday afternoon, communing with God's creatures and observing the beauty that he hath, in his wisdom, left for we his humble servants to worship. This is a song that has stuck in my head since 1963 - when I first heard it. As a teenager I grew from The Beatles and the Hollies to discover what I considered to be the real music of the heart - Bob Dylan, Free, The Moody Blues, Leonard Cohen, Richie Havens, Joni Mitchell, Neil Young, Jimi Hendrix, Jethro Tull, The Nice, Donovan, The Beach Boys - but there was always "Hey Paula". Such sweet innocence. The song was written by Ray Hildebrand (Paul) who first performed it at a Texas radio station in 1962 with his then girlfriend Jill Jackson (Paula). When recorded, the song sold over two million copies globally and was top of the American hit parade throughout February 1963. Their musical careers were short lived and they each took different directions after their moment in the spotlight. Paul will now be seventy three years old and Paula seventy one. 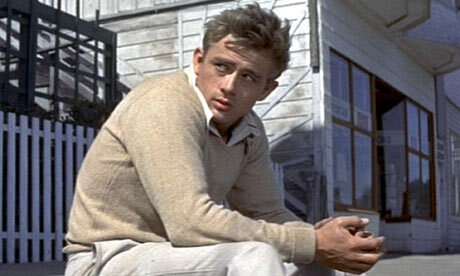 James Dean as Cal Trask in "East of Eden"
After reading "East of Eden", I ordered a copy of the 1955 film version directed by Elia Kazan. I was simply curious to see how the film interpreted Steinbeck's novel. The fact that James Dean was cast as Cal Trask seemed purely incidental. So I watched the film and the story it told was surely a very pale imitation of the novel. Adam Trask's history is hardly touched upon and we don't even see the Hamilton and Trask farmsteads in the Salinas Valley. Lee - the Chinese housekeeper and confidante - is notable because of his absence and Kate's brothel is shifted to Monterey - when in the novel it is down by the railroad tracks in Salinas.There can be very few literary films that are as far distant from the original text as "East of Eden". There was no doubt that the star of the film was James Dean - giving Cal Trask a prime significance that he doesn't really possess within the pages of the book. It was fascinating to look closely at James Dean in action. The part seemed made for him for in real life he lost his mother when he was still a small child and his relationship with his father was literally and figuratively distant. My Amazon DVD order came on two discs and on the second of these there's an old documentary about James Dean's life called "Forever James Dean". For someone who died so young - only twenty four - he was a fascinating character. He was surly and awkward, lonesome and devilish. He was fascinated by all forms of artistic creativity and tried his hand at painting and sculpture - even when he was a penniless actor, struggling to be noticed in Hollywood. And when he gained his all too brief success one of the first things he did was to buy a fast car. Speed also fascinated him. Back in Fairmount, Indiana where he grew up, his drama teacher was Adeline Nall. She said of Dean, "I loved that kid and he loved me I know". After a successful high school drama production in 1948, the cast bought Miss Nall a beautiful orchid to say thanks for all her hard work. Dean approached her and asked if he could borrow the orchid for a while. He took it away and made a painting of it - which Miss Nall kept until her death in 1996. Beneath the orchid Dean wrote two words - "Her Pride". I found this story quite touching. If James Dean hadn't been killed on that Californian highway near Cholame back in September 1955, and if he had survived lung cancer through all his cigarette smoking, he would have been eighty four years old last weekend. Though much of his legendary status surrounds the fact that he died so young, there are many who believe that he would have been an even bigger legend if he had lived to old age. There was so much more that this charismatic young man would have given the film industry - both as an actor and probably as a director too. "was sat" or "was sitting"/ "was stood" or "was standing"? Okay, okay - maybe I am just an old pedant but I can't help it. I can often forgive ordinary people's grammatical errors in everyday conversations but when such errors creep into the communications of highly paid and well-trained BBC broadcasters, my hackles rise. Let's get it clear. If you were "sat" somewhere - that means you were picked up and literally placed in your seat but if you sat there of your own freewill, then you "were sitting" in that place. It's the same with "stood". If you were "stood" say in the middle of a field, that means you were picked up and placed there but if you "were standing" in the field, that means you had walked through the gateway independently, dodging festering cowpats before arriving in the middle of said field to stand. Incidentally, why you should do that - I have no idea. So in Standard English terms, when you say: "We were stood at the bar waiting to be served" you are mangling our language. You should say: "We were standing at the bar waiting to be served". And when you say: "The cat was sat on the mat" you should really be saying: "The cat was sitting on the mat" or indeed "The cat sat on the mat". It may be that other fusty old pedants and I are fighting a losing battle on this one. The English language is forever evolving - not just through the addition of new vocabulary but also through changes to previously accepted grammatical constructions. Nonetheless, as I move inexorably towards my state funeral, I shall never say: "I was sat at my computer churning out nonsense", nor shall I say: "We were stood in the West Stand watching Hull City thrash Southampton". I cannot condone abuse. Surely the "news story of last week" accolade must go to Jose Salvador Alvarenga who arrived in the Marshall Islands after drifting across the Pacific Ocean for more than a year. In December 2012, he and a companion called Ezequiel set off on a short fishing trip, leaving the Mexican coast in a small fibreglass boat. A storm blew up and they found themselves being blown westwards, without the necessary facilities to turn back homewards. It is 5,000 miles from Mexico to the Marshall islands. At first Mr Alvarenga looked like a Robinson Crusoe figure - grinning widely as he stepped onto dry land.sporting a full beard. It should have been a delightful good news tale but there's something rather odd about it all. For a man who had apparently spent a year surviving on the fish and seabirds he caught he looked surprisingly robust - not an undernourished sunburnt skeleton of a man. Later, in a TV press conference, a now clean-shaven but miserable-looking Jose struggled to communicate and questions about Ezequiel's demise were left hanging in the air. Perhaps we will never know what really happened out there but when I look at that TV interview I see a man who appears to be traumatised - and not just by memories of his incredible voyage across the world's biggest ocean. Things don't quite add up. I have blogged about the millionaire Sheffield philanthropist Alderman J. G. Graves before. See here. Yesterday afternoon, before food shopping, I had a long walk round Graves Park in the southern part of the city. It was of course named after him. There are 92 hectares in total and the park contains ancient woodland, streams, the remains of an old packhorse route, football pitches, bowling greens, a cafe, tennis courts, a children's petting farm and an actual farm that specialises in Highland cattle. The parkland was given to the city of Sheffield by Graves in the mid nineteen thirties. Tired blogger resting by the bowling green. I hope he wasn't dead. country estate here before the arrival of William the Conqueror and those pesky French. panel, this one is called Bob. Dog walkers. Young mothers pushing prams. Old people sitting on benches. Toddlers feeding the ducks. Football players and lone photographers like me. Schoolchildren strolling home. In cities, parks like Graves Park provide the opportunity for time out from domestic life. No walls. No television or radio blaring. Green grass and trees. The promise of springtime stirring. Thanks again John Graves. Gone but not forgotten.